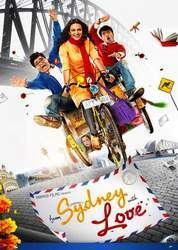 From Sydney with Love is a feeble combination of three films: Dil Chahta Hai (2001), Dilwale Dhulaniya Le Jayenge (1995) and Salaam Namaste (2005). A film doesn't need to have stars like Shah Rukh, Aamir, Saif, Kajol or Preity to be funny or romantic. It needs a screenplay, which grants enough room to let the actors create moments of cheesy escapism that could exist only on screen. This filmhas all its formulas in place. Love story: check. Foreign locales: check. Good songs (with one remix): check. Funny dialogues: check. The two boxes that are left unchecked are: the story and the casting. The story stands thus: Lubaina loves Raj. Raj loves Megha. Megha loves Rohit. Rohit loves Megha too. Then there is that one guy who adds nothing to the plot. Thing is, this love quartet doesn't have much of a conflict to begin with. Sadly, this is not the only reason why the film doesn't work. Raj is introduced as he comes out a large box labeled: "Gift to womanhood". I chuckled. I love it when films don't take themselves seriously. Raj is played by Prateek Chakravorty who has also directed the film (thanks to a bit of nepotism). It seems funny that he is aware that he isn't a typical Bollywood hero material and mocks it. But then he gets a typical song and acts all Bollywood hero-like. That was the first in a series of cringes that ensued. Soon, we see this character being taken too seriously. Now wouldn't it be a good movie about a real person who doesn't have a body of a god but expects his life to have the same fairytale ending that we see in the movies? Sounds like a good enough concept, right? Alas, the movie around it just isn't and has a thoroughly filmy world of its own. Megha portrayed by Bidita Bag whose diction is atrocious. Why three boys in the film were hopelessly smitten by her and not Lubaina (who has bad diction too but also happens to be hot) is beyond me! Megha is a regressive small town girl who only wants to study and doesn't wish to debauch. Then comes a moment which made my jaw drop as she finds herself getting naughty with, mind you, the guy she loves and, for some godforsaken reason, stops talking to him! Who does that? Later, she reveals another plot point, which is even more bizarre. Rohit (Sharad Malhotra) on the other hand, hopelessly in love with Megha, also takes a decision in the film, which is stupendously odd and doesn't make sense with the characters previous actions. Obviously all these things lead to utter perplexity and unintentional hilarity for the viewer. The epilogue is highly disorienting and simply wrong. It isn't bad, it isn't good - it is just wrong. One sequence shows India in such bad light that I'm sure it would make even the unfounded detractors of Slumdog Millionaire (2008) shy away in embarrassment.I definitely don't want to see a movie about a filmmaker's college experience and/or how kind a person he is, I want to see a movie about actual characters, who have a story around them. Farhan Akhtar had also based Dil Chahta Hai on his experiences in college. But Im sure he knew we aren't interested in his love life. We are interested in the lives of the characters. This film, while being a mess, isn't boring at all but it isn't entertaining either. It tries too hard to be funny and romantic and ends up being neither.From Sydney with Love is actually From Sydney with Nothing Much. From Sydney with Love is the most plagiarized film you will ever see. It is so shamelessly inspired by so many other films, you tend to forget the film you are actually watching. Characters written with such amateur inconsistency that you cant help but see an Aditya of Jab We Met in the main character of the film Rohit, or an epic failure of an Aamir Khan from Dil Chahta Hai. What is beyond logic is that the actors themselves resemble like struggling versions of successful stars. The heroine played by one Bidita Bag has the diction of Kangna Rannaut while she vaguely resembles a Deepika Padukone. The hero looks like an out-of-job Jugal Hansraj who has decided to quietly sneak back in Bollywood. Theres no point in talking about the plot because the film has the most incoherent stories ever written, if written at all. Till the first half, you see characters in a Sydney university having fun, getting along, bitching et al but once the location shifts to the more economical Bengal, the film not only sees a geographic change but transcends totally into an unrecognizable product. It is like watching two-three films separated by a recess. Heres a brief attempt: Bright but small town girl goes abroad to study. Despite being a super-hot Indo-Australian girl around, all Indians in Australia seem to lose all consciousness when our village belle is up and hanging about. The plump Raj, an avid Bollywood-lover tries all tricks from the enormous book to a confused response. While Rohit is the smooth talker. His innocence and baby-face charms Miss Goody Shoes, and they both see each other for a while and it is established there is genuine love. Then tragedy strikes. No, not racism attacks down under. Something worse and more sinister. They make love. After sleeping together one night, the woman acts as if she has been subjected to third degree brutal torture. Devastating for the self-esteem of our hero, I assume. Such regressive attitude in a contemporary Hindi film is not only shocking but it is dangerous. And especially when there arent any plausible justifications for it. The woman is so traumatized, she leaves Sydney. Hero follows suit. Heroine now tells in India she is pregnant. Hero runs away citing career and responsibility issues. WTF ? The directors screenplay is a piece of terrible writing and there is a lot of it. The dialogues are banal, without the slightest trace of wit or humor while the inconsistency in characters and plots are as huge as the distance between Bengal and Sydney. There is no reason why should watch this film. The actors especially compete in outperforming each other in the Bad Acting category and it is hard to tell who can walk away with the trophy. Even the adorable Australian-Indian girl; one character who can usually get away with bad performance owing to linguistic barriers, becomes annoying with her cute accent gone cranky. The direction is so inspired from elsewhere, I almost saw a scene stolen from Rockstar, followed by one similar to Fashion; while collectively it became a film made by a poor mans Imtiaz Ali, one aspiring to be a Yash Chopra. Technicalities in any film can be bargained if the inherent idea is sincere and honest; at least progressive thinking. But the makers of From Sydney with Love fail to estimate the influence of cinema.